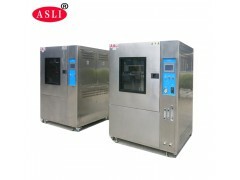 Rain Spray Test Chamber is applied to test the shell's waterproof effect of electronics, automobile and communication, using rainfall simulation to test the product's waterproof performance and assess the product's waterproof performance's loss classification. 1. Water pressure and flow rate adjustable. 2. Unique sprinkler can stably control the rain quantity and pressure. 4. Inner case's material is imported steel plates, Shell is made of #304 stainless steel. 5. This equipment applies rain spray test for products and parts.